Following the first season of Star Wars: The Clone Wars, Topps produced one of their best card sets ever. Released in late November of 2009, this widevision card set showcases the first season of Star Wars: The Clone Wars animated television show. 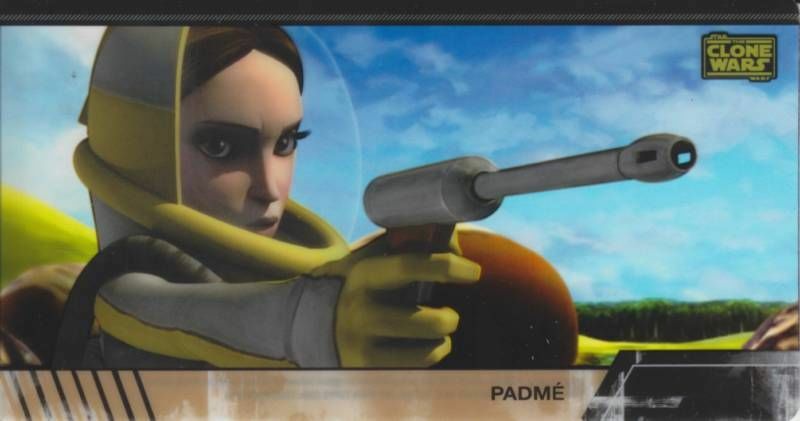 Widevision cards give the set a stronger look than the earlier Clone Wars movie card set, showing more of the action, and generally presenting more of the imagery that makes the cartoon television show interesting. Because the show tends to focus on action sequences, the wider space is often needed to capture fully what is happening in a particular scene. In addition to the 80-card base set, chase cards included eight Season Two preview cards, 20 foil cards, and a ten-card set of Animation Clear Cel cards. This card was either a pull from one of boxes I purchased from Big T Sports’ Cards or bought from Triangle Cards at Star Wars Celebration V for $2.